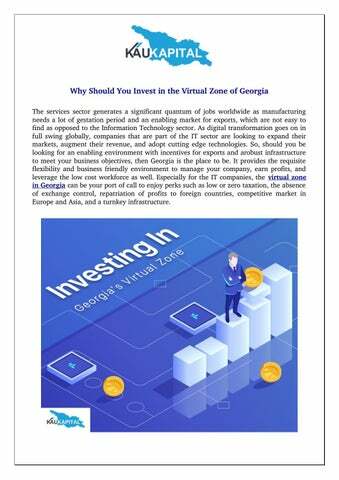 Why Should You Invest in the Virtual Zone of Georgia The services sector generates a significant quantum of jobs worldwide as manufacturing needs a lot of gestation period and an enabling market for exports, which are not easy to find as opposed to the Information Technology sector. As digital transformation goes on in full swing globally, companies that are part of the IT sector are looking to expand their markets, augment their revenue, and adopt cutting edge technologies. So, should you be looking for an enabling environment with incentives for exports and arobust infrastructure to meet your business objectives, then Georgia is the place to be. It provides the requisite flexibility and business friendly environment to manage your company, earn profits, and leverage the low cost workforce as well. Especially for the IT companies, the virtual zone in Georgia can be your port of call to enjoy perks such as low or zero taxation, the absence of exchange control, repatriation of profits to foreign countries, competitive market in Europe and Asia, and a turnkey infrastructure. Easy to set up an IT company due to the absence of red tapism – no requirement of licences, permits, and sundry documentation. Ready to use infrastructure and dedicated land. Availability of low cost but skilled workforce. The cost is said to be one of the lowest in the EU trade zone. A slew of tax benefits including the ones in income tax, customs and GST. The business owner need not stay in Georgia while operating the IT company. The income yielded from a VZE is exempted from VAT and income tax should the same had been earned by servicing clients situated outside Georgia. Dividends distributed to a non resident shareholder or legal person to be taxed at a flat rate of 5%. 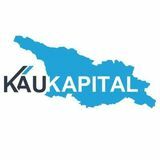 Dividends distributed to a foreign shareholder shall be taxed subjected to the double taxation agreement existing between Georgia and the country of origin of the said shareholder. Dividends given to a local shareholder shall be exempted from taxes.